A lot of products for Athlete’s foot are being sold on the market nowadays. This is why we are going to review one of the best products available online: Bayer Lotrimin AF Athlete’s Foot Deodorant Powder Spray. This product claims to treat the bothersome signs and symptoms of athlete’s foot such as burning, itching, scaling, discomfort and cracking. Aside from these benefits, it claims to have been tested and proven in the treatment of athlete’s foot (tinea pedis), jock itch (tinea cruris) and ringworm (tinea corporis). If you want to find out more about this product then read on. Miconazole Nitrate (2%)- This is an anti-fungal ingredient that treats fungal infection of the skin such as candidiasis, athlete’s foot, fungal rashes, infections of the groin and ringworm. It also has antibacterial properties and is able to kill certain bacteria that are present in the infection. 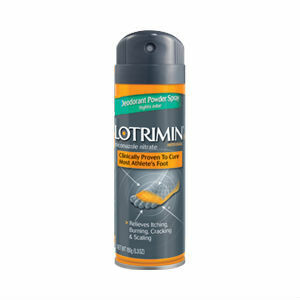 Bayer Lotrimin AF Athlete’s Foot Deodorant Powder Spray should be sprayed on the affected area twice daily, in the morning and in the evening. If this product is used for athlete’s foot, the spaces in between the toes should be paid special attention to and well-fitting shoes should be worn. Socks should be changed daily. Use this product daily for 4 weeks (the same holds true for ringworm cases). For jock itch, this product should be used every day for two weeks. Seek a doctor’s advice if the symptoms persist. From the reviews of the product that we found online, it seems that this dosage is considered enough to treat infections if used correctly. Some customers have said that they experienced stinging and burning on the area when applied to open wounds. Do not spray directly on open wounds and sores to avoid irritation, itching and burning. Bayer Lotrimin AF Athlete’s Foot Deodorant Powder Spray is sold at a price of $9.80 ($1.96 / Ounce). Amazon offers free shipping on orders over $35. Though there are many positive reviews on Bayer Lotrimin AF Athlete’s Foot Deodorant Powder Spray, its official website does not offer any information regarding its guarantee. This may be a cause of concern for consumers because if the product doesn’t work or has defects, they simply cannot return it to the manufacturer. There is no hotline or customer support for complaints or questions on the product’s official website. There are many customer reviews on this product claiming that it is easy to use, effective, healing, soothing, and may get rid of other infections. Some customers have commented that it not only works on the feet but it may also be used on the groin, under the breasts and other areas of the body as well. Some also claim that it can stop itching immediately and can clear up fungi within a few weeks of use. These customers also noted that it can stop fungal infections faster than other anti-fungal products. Bayer Lotrimin AF Athlete’s Foot Deodorant Powder Spray is a great product because it is easy to use and effective. However, it should not be used on open wounds and sores and it can also be harsh on sensitive skin. It also lacks a guarantee statement on its website. It would help if they offered some guarantee for customers to give a general idea of whether or not this product is safe and effective for everyone. Jimmy Rodriguez	reviewed Bayer Lotrimin	on November 16th	 and gave it a rating of 2.5.